At this very moment, I’m “invigilating” the RACGP’s KFP exam (one of the three Fellowship exams) in Brisbane. To the uninitiated, the word “invigilate” is of British origin dating from the mid-1500s, specifically meaning “to watch examination candidates, especially to prevent cheating.” I know this because my mother duly informed me of such in an email this morning. I casually that mentioned to my mum, during a Skype call earlier this week, that I was going to be invigilating on Saturday and she was curious enough about the unfamiliar (to her) word to look it up. 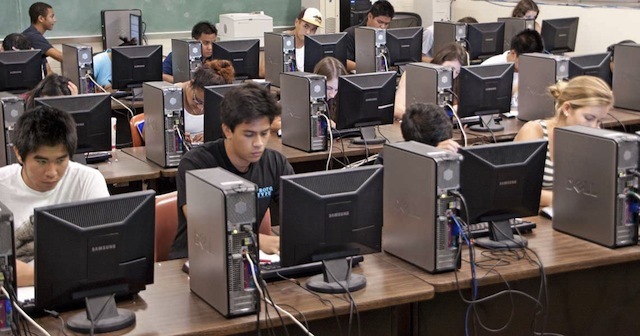 As I look into the sea of earnest faces as they type away (yep, the exam is computer based), all I can think of is “thank God it is them and not me.” I may be the “teacher” but I reckon that if I sat the exams today, I’d probably fail. If patients want a GP with excellent theoretical knowledge, I recommend they seek out a GP registrar who is about to sit, or has just sat, the Fellowship exams. Breadth-of-knowledge-wise at least, for most of us, it is all downhill from there. 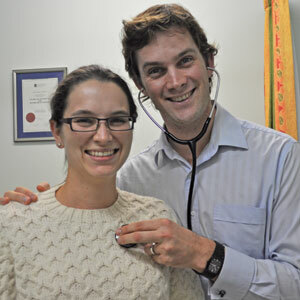 Drs David Chessor and Suzanne Lyon – recent successful RACGP exam candidates. In my medical educator and RACGP examiner roles I spend a lot of time working with GPs in the peri-exam phase of their careers. I’m constantly impressed with how much “stuff” they know and find myself wondering where all the “stuff” I used to know has gone. I’m not yet forty, so can’t blame age-related cognitive decline. I did get a knock to my head which resulted in six facial fractures and temporal lobe contusions, but I passed my FRACGP OSCE exam three weeks later so it can’t have done me too much harm. And yet here am I, constantly having to look up drug doses, item numbers, clinical guidelines and the anatomy of the facial nerve. Sometimes I feel like I’m just an ignorant lump of carbon. The human brain is an unfathomably complex and wondrous organ, but its data storage and retrieval capacities are beaten hands down by a $5 USB flash drive. Now before you put in a concerned call to the Medical Board, let me assure you that I am a safe and competent doctor. I’m pretty good at knowing what I don’t know, and just as importantly, knowing how to fill the gaps left by the information that sneaks out of my cranium after dark. I can Google with the best of them and I’m adept at ‘phoning a friend’. What’s helped me most in my quest for knowledge retention is teaching. For me it is not a matter of “Those who can’t, teach”, but more a case of “If you don’t know it, teach it”. I find that there is nothing as effective for memory-boosting as explaining to others, especially with the luxury of repetition. By the third or fourth time of delivering a particular topic, the content is usually firmly cemented in my brain. While it is all very affirming and enjoyable to teach what you know well, preparing for and then teaching things you don’t know much about is so much more valuable. If you’re up for the challenge, combining an unfamiliar topic with a knowledgeable group is even better. You can channel and feed off their combined wisdom, and practise your skill at deflecting or redirecting those tricky questions. I may know less about more nowadays but I’m happier than I’ve ever been. Perhaps ignorance is indeed bliss. Luckily, there is a lot more to being a good GP than the instant recall of facts and figures. For the pathophysiology of kidney disease you can always ask Dr Google, or a registrar who has just sat those dreaded exams. I may not have been capable of passing the AKT/KFP exams if I was a candidate today, but I think I’m doing a passable job as an invigilator. I did, at least, remember the meaning of “invigilate”. Unlike my mother. For the irony of her looking up and emailing me the definition of “invigilate” this morning is that 6 months ago (at the time of the last AKT/KFP exams) my mum and I had a Skype conversation about the word, during which I explained its meaning. Perhaps “invigilate” for her is like the “pathophysiology of chronic kidney disease” for me. This entry was posted in Blog posts and tagged general practice, good practice, GP, medical education, medicine, RACGP exams by Genevieve Yates. Bookmark the permalink. I hear you, Genevieve. I got my fellowship only last February, yet already I feel my knowledge (which was shaky at best) rapidly dwindling away… I comfort myself by thinking that having learned something once, your brain is ready to receive it again and it will slot neatly in after a quick refresher course or targeted reading. Learning how to learn is more important than learning facts, my dad used to tell me. As a young pup I disagreed with him, but now I see the wisdom in his words. Thanks for your post, I enjoyed reading it.